The reading group I joined this year, selected Jane Austen’s Pride and Prejudice to read for April. Austen was born on December 16, 1775 and died on July 18, 1817. She was an English novelist whose works of romantic fiction earned her a place as one of the most widely read writers in English literature. Romance is not my usual choice of genres, but I’m open to reading it. I didn’t think I’d like Faulkner when Intruder in the Dust was selected and now I’m a fan. 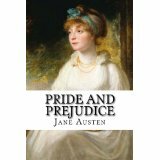 Wikipedia states that Pride and Prejudice, first published in 1813, is a novel of manners. “The main character, Elizabeth Bennet, has to deal with issues of manners, upbringing, morality, education, and marriage in the society of the landed gentry of the British Regency. She is the second of five daughters of a country gentleman living near the fictional town of Meryton in Hertforshire, near London.” The title relates to Elizabeth’s ability to overcome her prejudice and Darcy’s ability to overcome his pride. Have any of you read Pride and Prejudice? Any comments on it if you have? My advice is to ignore whatever anyone else has said about this book, and just read it with as fresh a mind as you can bring. It is a wonderful work that you should enjoy it without anyone else’s analysis of what it means or what it is about. Read the analysis and critiques afterwards. They are fun to think about and sharpen your own thoughts. But if you can read it without others’ ideas I think you will enjoy it the most. Thanks for the advice, Emily. Okay, no more checking what other people say. I’ll read fresh. Miss you, can you stop by the class sometime soon?